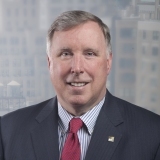 David J. O'Brien, is a Partner and CMO at EY ( Ernst and Young) in New York City. With thirty years of experience at EY, David's rise to partner has been one of steady and consistent contribution. Charged with advancing the core competencies at EY through several thousand global team members; David's philosophy is one of advancing the nexus of Strategy, Communication and Brand. Incorporating a true sense of purpose into every level of the EY brand, this well proven philosophy David has employed, to collectively engage his global team to the next level of achievement, has proven to be a path well worth taking toward the road to success. David also has a very strong commitment to "Pay it Forward.” Through his various efforts in the areas of economic empowerment, poverty alleviation and children just to name a few. It is crystal clear that David embraces a sense of service in all aspects of his life. In his spare time, David enjoys spending time with his family!